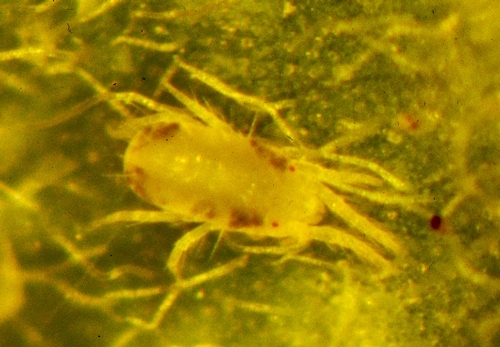 Lewis spider mite or Lewis mite, Eotetranychus lewisi (McGregor) (Phylum Arachnida, sub-class Acarina, family Tetranychidae) is a pest of many host plants. In the US, it has been reported on citrus and greenhouse poinsettias. Lewis mites have been seen on strawberries and raspberries in the Ventura area for some time, but growers appear to be noticing increased infestations in the recent years. Some growers have also seen them in Santa Maria in the recent years, but they have so far not been reported from the Watsonville area. Considering the recent trend, growers might keep them in mind while scouting for pests. Environment, natural enemies, cropping patterns, pesticide usage and other agronomic practices are among the factors that influence the status of pests. It is not yet clear why infestations are increasing, but here is some information on Lewis mite. Biology: Males are about 0.25 mm and females are about 0.36 mm long. Species identification is tricky and requires both sexes to be examined microscopically. They can be confused with twospotted spider mite (TSSM), Tetranychus urticae in their general appearance. But, comparing adult females, Lewis mites are smaller than TSSM and have several small spots on their body while TSSM have a single dark spot on either side of the body. 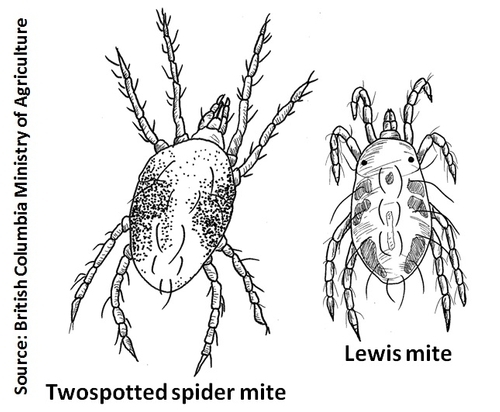 Lewis mite has five life stages – egg, larva, protonymph, deutonymph and adult. Eggs are round, whitish to light orange. Females lay 60-90 eggs over a period of about a month. It takes about 12-14 days from egg to adult stage at 21oC (70oF). Damage: Symptoms of damage vary according to the host plant. On poinsettia, Lewis mite feeds on the underside of the leaves and causes very fine stippling or flecking on foliage, which can be initially mistaken for nutrient deficiency. Infestations can build to high levels in poinsettia before mites and their webbing are noticed. Since their infestation in strawberries currently coincides with TSSM infestations, exclusive Lewis mite damage symptoms in strawberries are yet to be determined. In some hosts like papaya, damage resembles symptoms of viral infection and may cause distortion and yellowing of young leaves. According to Daniel Gilrein, an extension entomologist from Cornell University, fine flecking from Lewis mite feeding almost resembles nitrogen deficiency and can delay detection until populations build up. Leaves turn brown and webbing can be seen as the damage advances. What to do: Look for Lewis mites while scouting for TSSM especially in fields close to infested ornamentals. Keep in mind that there could be resistance or efficacy problems with some miticides in certain areas with TSSM or Lewis mites. It is always a good practice to rotate miticides with different modes of action for better management and reducing the risk of resistance development. The mode of action is indicated on most lables (e.g. Agri-Mek is a Group 6 Insecticide) If you suspect resistance in TSSM or Lewispopulations in your area, perform a simple test to evaluate the effectiveness of the intended miticides. Dip several mite-infested leaves in a cup of miticide solution (concentration similar to the field application rate), let them dry and then cover (to keep foliage from drying out completely) and place in a cool area away from direct sun. Check to see if any mites have survived 24 and 48 hours after dipping. The effectiveness of the miticide will be indicated by the number of mites alive or dead. For comparison, dip several similar mite-infested leaves in normal water and treat similarly, observing the survival of mites on those leaves as well. This can be a useful comparison for new, untested miticides as well as for older products where miticide resistance is suspected.